IS ON HOLD DUE TO LANDSLIDE- MAYBE AT THEN END OF 2019/2020 THE TRAIL WILL RE-OPEN and we will start organising the hikes again. WE ARE ORGANISING FOREST SHUTTLES WHERE WE WILL EDUCATE YOU ON THE TRAILS YOU CAN GO ON IN OUR AMAZING GEM OF A FOREST. YOU CAN HIKE ON YOUR OWN - CALL US FOR MORE INFOMRATION. Molokai Outdoors Activities offers two options for those wishing to hike the Kalaupapa Trail. There are two tour companies in Kalaupapa both run and operated by former patients. You can book with Kekaula tour and call them at 1-808-567-6088 OR Hawaii Expeditions at 1-808-349-3006. We are currently not taking the reservations at this time. If you have a group you can call us and we will help you with all the logistics as we are really only handling groups when it comes to Kalaupapa. We can set you up with hike/mule or air. The boundless beauty you will experience as you traverse the 2.9 mile trail, with 26 switchbacks, leaves most folks absolutely speechless. This hike is strenuous on the knees going down the 1600 ft descent. Take your time and enjoy the scenery. Upon arriving in Kalaupapa, you'll be met by your guide and for the next few hours you'll experience one of Hawaii's most remarkable tours, in a community hidden from the world for so many years. You will learn about the leper colony, its people, incredible tales of struggle and human suffering, along with stories of courage and love. 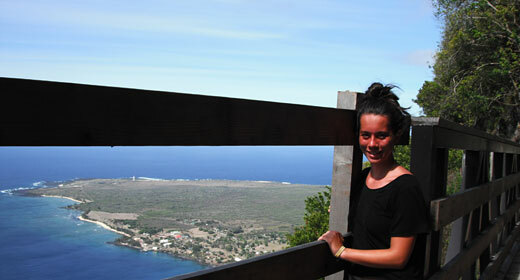 All hikers to Kalaupapa must obtain a permit and a reservation for the Kalaupapa Tour. If you would like our assistance with arranging your Kalaupapa experience, please use the Contact Form to let us know how we can help.